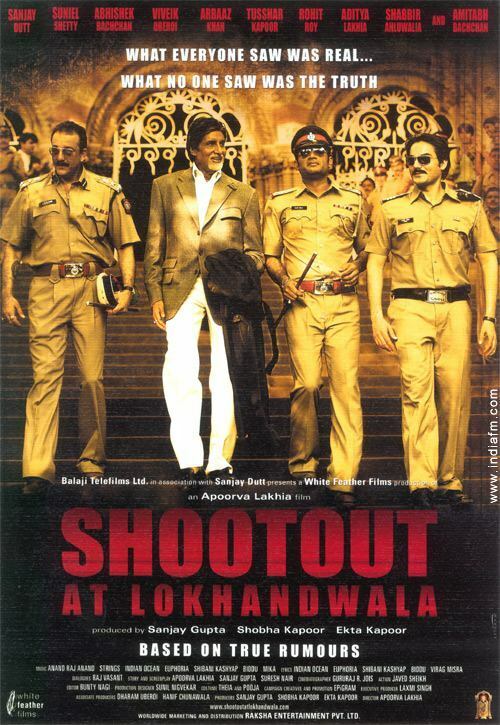 Based on the shootout in Lokhhandwala 1992, when commissioner of police, Aftaab Ahmed Khan, shot Dawood Ibrahim's aides including Maya Dolas and Dilip Bua. This caused massive controversy after it was rumored that Dawood asked for the shootings to take revenge on his aides who has fallen out with him. this actually looks very interesting... according to sanjay gupta the movie isnt exactually gonna be a dramatisation of the events but more of a docu-drama.. he said that they are trying to obtain the rights to some footage from news channels of the actual event so it can be used in the movie.. the pre-release teaser thing they showed at the iifa awards was gruesome stuff.. just hope it is good.. fantastic line up!! will dig some of the promo material out and show u guys! Sanjay's version of the truth? I realize it's Sanjay Gupta but this movie looks worth it. Besides, it's directed by Apoorva Lakhia. Yes I know Ek Ajnabee was a copy of Man of Fire but even Gupta has made 'inspirations'. The movie's star cast should be enough to draw people in. The posters look great: http://indiafm.com/movies/wallpapers/12834/index.html. Vivek back to his Company roots, should be interesting seeing Tushar in a negative role and correct me if I'm wrong, but is that Kaachra from Laagan as a baddie? If Gupta does get the rights to use real news footage, then it has potential to be a good docu-drama. Sanjay Gupta might be infamous for his "inspired-by" works, but Apoorva Lakhia isn't exactly reason to rejoice, either. His first film, Mumbai Se Aaya Mera Dost, was utter, boring, garbage. His second (Ek Ajnabee) could have been one of the year's best films... if it hadn't already been made by someone else shortly prior. I'd think the star cast grants the film some credibility, but, just because the actors are great, doesn't mean the film couldn't be plagiaristic crap. Fingers: crossed; but, skepticism: on. this was reported a while back to be a remake of johnny to's 'breaking news'(which was a terrible film btw). from the looks of the pics on indiafm, I wld say it seems likely so. gupta seems to be on an asian film remake streak.. I saw this over the weekend at Cineplaza 13 in North Bergen, NJ (my first trip out there from Manhattan, took the NJ Transit bus). The film itself was pretty good. A bit random in plotting but I felt that the more brutal parts of the movie made it worth price of admission (a kid stabbing someone repeatedly, a man getting his head stomped in while his jaw is on the pavement, etc.) Little B appears for all of 5 min. but the Big B steals the movie (also with a smaller than usual role). I thought it was pretty entertaining and the musical numbers did their job. Vivek Oberoi and Sanjay Dutt were also memorable here. This film is not very accurate to the true story and although I think it was a great idea to make into a film, the fact that it's too 'commercial bollywood' is it's main fault. I suppose there will be an audience for this but I must say that while entertaining in some parts, I was overall disappointed. Even if Ram Gopal Varma made this film it would've been alot better. What I found interesting is that the ATS were tipped off by Dawood Ibrahim, sparking suggestions that they were carrying out his orders. At the end of the film I just didn't care about any of the characters. They tried to make the ATS look like heroes, while glamourising the gangsters, but with the way the characters were protrayed in the film I really wouldn't care if they all died on both sides. Amitabh's overacting was just further proof that he should take a break. a man getting his head stomped in while his jaw is on the pavement, etc. That scene was copied or 'inspired' by a scene from American History X. And done rather badly I must say. But maybe shocking enough for Indian audiences. I say it's definitely worth seeing. My perspective may be different though on Bwood titles as I'm looking at it from a non-Indian pov. However, the film was pretty entertaining, of course it's probably not true to the actual events. But it is pretty solid and the violence in the film caught me off guard (which to me is a good thing). Yes you'll get the gangsters singing and dancing (only one scene I believe). That's the best part for me actually! bhaskar, I personally wouldn't recommend it to people, unless I know they like bad films. It was such as waste. A great idea, badly done, even comical in some places. I just didn't care about a single character. The entire police force could've got killed, it would've made no difference. The gangsters sing and dance with a girl in one (or two?) song(s), which was OK, though silly as expected, but we also have a stupid rap that Vivek and his gang perform. I guess kids would like that. One member of the gang keeps on seeing the ghosts of dead people he has killed and when that character is eventually killed he sees the ghosts watching him. For a film that is supposedly based on fact, this is a bad choice. A homage to Kaante/Reservoir dogs showing the gang walking together acting tough. Too much fast-editing, Tony Scott, MTV-style. The climax of the film when all the gang meet their demise was just so ridiculous. It was a very "bollywood" ending which I think is a problem when trying to do a film based on fact. When the dead bodies of the gang were put in the van and that soppy music came on as if to evoke some sort of sympathy from the audience, it reminded me of the end of Kaante. In both films you just don't care about the characters. There was little truth in the film, for example Maya Dolas never really killed his father as a kid as is shown in the film. Maya Dolas died a few years before his father. Last edited by Mr_Khiladi on Thu Jun 28, 2007 7:12 pm, edited 1 time in total. Well, if we continue watching, all yrfers, johrer, dhawanis, bhago bhago..priyas and verma ki kichdis, then why not!! !